Seasons are explored in one form or another at every grade level. As students get older it's important for them to learn about the Reasons for the Seasons. Students need to learn that Seasons are caused by the TILT of the Earth as it REVOLVES around the Sun. Here's a few resources to help children understand this important concept. View an excellent Slide Show. Have students use manipulatives/props to represent the Sun and Earth to demonstrate the Earth revolving around the Sun. In this picture we used a globe and a LARGE yellow exercise ball. Make a Science Foldable showing the Earth's tilt and revolution (orbit) around the Sun. This activity comes from the blog Third Grade Thinkers. Read some good books about the Reasons for Seasons. Gail Gibbons book, The Reasons for Seasons, is one example. Her books are always excellent. Enjoy learning about weather and seasons! Kids seem to really enjoy Word Search Puzzles. Word Searches help to introduce and or review important vocabulary with any subject. Here's a Water Cycle Word Search Printout that I just completed and uploaded. I also uploaded a 4 Circle Cycle Diagram Printout as another way to introduce or review the water cycle. The students need to add a title and then add words and or pictures to the diagram. Both free printouts can be found on my website. Click on the link below then go to Free Worksheets. 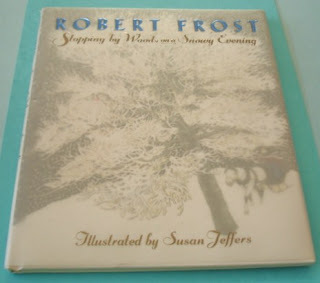 I've always loved Robert Frost's poem Stopping by Woods on a Snowy Evening. A Weather Unit is only one of many, many different times to introduce this wonderful and timeless poem to children. 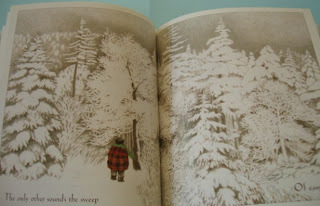 Of course the illustrated version by award-winning illustrator Susan Jeffers is just gorgeous! I like to read the poem to children first without showing them the illustrations. I like to have the students close their eyes and pretend that they are there in the woods. They talk about what they see and hear in the woods. Then I show the students Susan Jeffers illustrations and they talk about how their visions of the woods were similar or different. Here are some pictures from a class of mine that decided that they wanted to create their own illustrations. Each child or pair of children chose one or two lines of the poem and together they made their own illustrated copy of Robert Frost's poem. Then they scanned all their pictures and downloaded them onto the computer. Finally they put their book into a PowerPoint Slide Show and shared it with family and friends. The kids loved this project but there are so many different follow-up activities that can be done with this book. If you have not used this book yet with children, I highly recommend it. It may be available at your local library. It is truly a book for young and old! Here is a selection of Weather Themed Craft Activities. I plan to add even more in the next few weeks so if you get a chance, please come back to check out this post! Have fun learning about weather! STORMS can give us a heavy downfall of rain, snow, sleet, or hail. Storms may also have heavy winds plus thunder and lightning. Here are 2 excellent sources of information for kids that talk about different types of storms: thunderstorms, tornadoes, hurricanes, and blizzards. Click on the links below to view the Slide Show and Video. 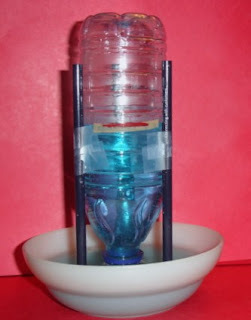 As a follow-up activity, the kids might like making their own tornado using 2 recycled plastic bottles. Click on the link below to go to my earlier post that gives directions. 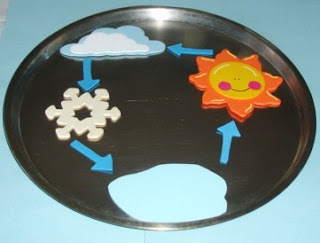 This post is about how children can make a Water Cycle Diagram with inexpensive manipulatives. I didn't know it but this post started when I pinned a picture from Mrs. Kelly's Kindergarten on my Pinterest Weather Board. Mrs. Kelly and her class made a cute water cycle bulletin board. You can view it here. I already had a snowflake in my craft supplies. For now, I made the missing pieces with foam (from the Dollar Store). So now I have a smaller version of Mrs. Kelly's Water Cycle that children could use to create their own water cycle. 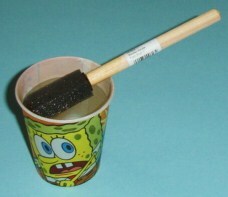 As the children get older, they can be introduced to the terms evaporation, condensation, precipitation, and collection. Younger children can use the symbols for the Sun, Clouds, Raindrops, and a Puddle (or the Ocean) to learn and illustrate the steps in the Water Cycle and how it keeps repeating. E-VAP-O-RA-TION ...... a BIG word for little kids!!!! Here are some activities to help children learn the word and understand this process of a liquid (water) changing to an invisible gas (water vapor). Place a clear plastic bowl or cup on a counter or windowsill. Fill it half full of water. Mark the water level with a permanent marker. Have students PREDICT what they think will happen to the water. Each day OBSERVE the level of water. Sketch a picture of the cup and liquid in a science notebook/journal. Observe again each day and sketch or record the data. Ask the children the following questions? Is the water level the same? Is there more or less water? What happened to the water? Why? Go outside on a bright sunny day. Using a safe area (sidewalk, schoolyard, park etc.) have the students write their names (or draw a picture) on the pavement with the water. The pavement usually turns darker. Can they still see their names after a few minutes? Ask the children if they notice anything happening to their pictures. (They should be drying up as the water evaporates.) Ask the kids what happened to the water. Where did it go? What did it become? Why? 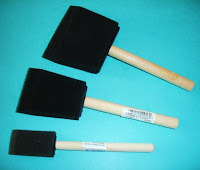 If you have access to an old fashioned chalkboard, have students wash the board with a sponge, then observe the board. Several minutes later have students examine the board. Continue until all the water has evaporated. Ask questions of students similar to the questions in activity 2. Use 2 plastic containers the same size. Fill each with water 1/3 full. Cover one container. Have the kids PREDICT what will happen to the water in each container. Each day OBSERVE the water in both containers. Does the water level stay the same in both containers? 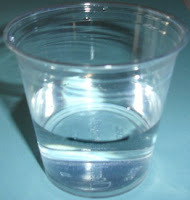 Have students DESCRIBE the level of water in each container. Compare/contrast the water levels. Explain why this is happening. Was your prediction correct? 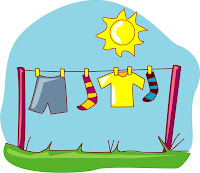 If a clothesline is available, have children help hang wet clothes on a clothesline. 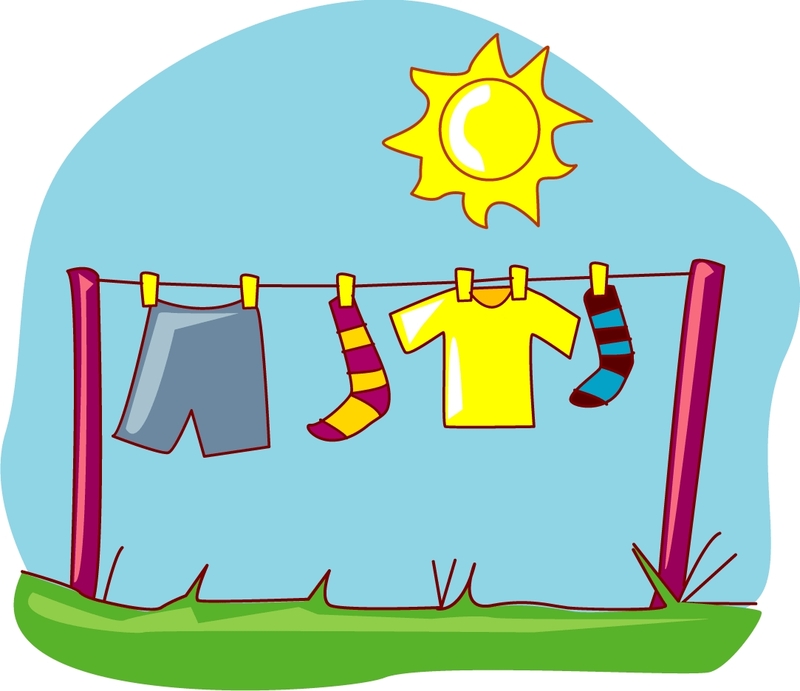 As clothes start to dry ask questions similar to activity 2. Children may want to "celebrate" their knowledge of this new word! 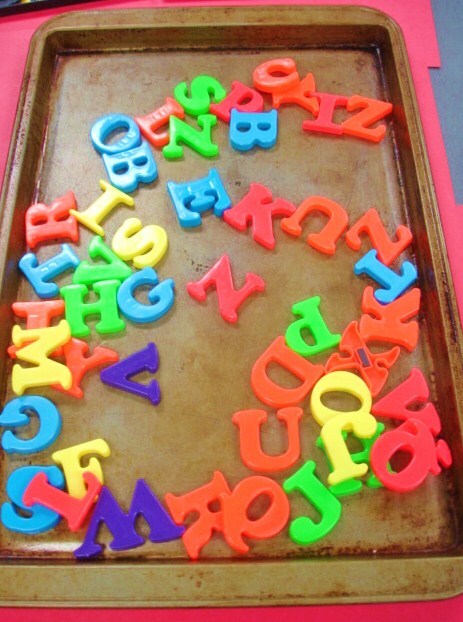 Have children use foam, magnetic, or other letters to copy and spell the word evaporation. Display the word on a magnetic board, refrigerator door, etc. Have younger students clap out the syllables. Children could also write out the word evaporation in bubble letters or with glitter glue or use another artistic method to practice writing and using this new vocabulary term. These words could be added to a bulletin board display or word wall. The Magic School Bus Books with their main character Ms. Frizzle are very popular with kids. 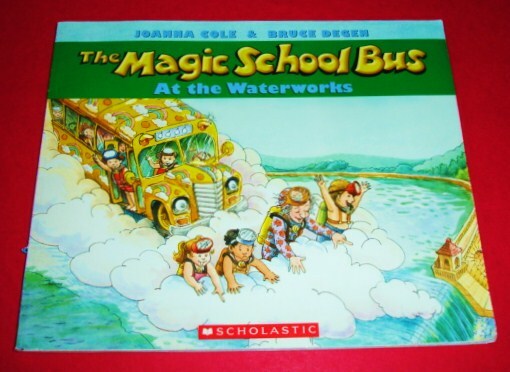 The Magic School Bus at the Waterworks would be a great help in teaching the water cycle. The children only need to read the first 19 pages of the book to learn about the water cycle. The rest of the book teaches about waterworks and reservoirs and how communities get their water to our homes and buildings. The authors do a wonderful job explaining the water cycle process. If you want to extend the learning further with older children, I would suggest also bringing in 4 important vocabulary words (evaporation, condensation, precipitation, and collection). The authors do use "evaporates" and "evaporating" in the story. I have a handout with a (color, cut, paste) diagram of the water cycle that uses the 4 vocabulary terms to help students learn the vocabulary. You can download a free copy on my website. Click the link below then go to Free Worksheets. Another good Magic School Bus Book about the Water Cycle is The Magic School Bus Wet All Over. Have fun learning about the water cycle! There are 2 scales for measuring temperature ...... the Fahrenheit scale (F) and Celsius or centigrade scale (C). Learning to read thermometers is an important science and math skill. Making Learning Fun (www.makinglearningfun.com) has some adorable, free Temperature Cards that you can download. They are actually beyond adorable with a little penguin on each card! What a great way for children to practice this skill. Click on the link below. 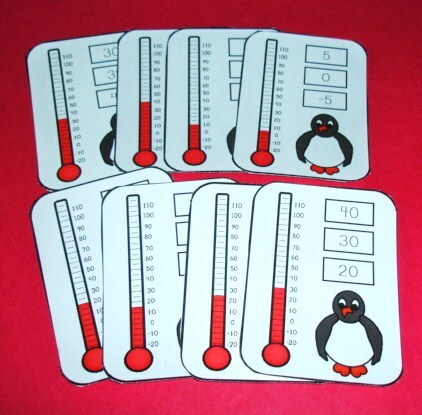 Homeschool Creations has a great thermometer printout that the kids could use every day to record the temperature. She uses it as part of her homeschool morning board. The kids could first read a real thermometer or they could look up the day's temperature on the internet, then use the printout to record the temperature. Click on the link below. 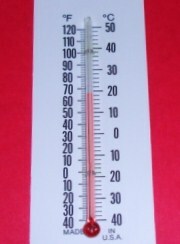 To read an earlier post on how to make a homemade thermometer click on the link below. Have fun learning about thermometers and weather. Of course when learning about weather it is important to learn about thermometers and temperature. 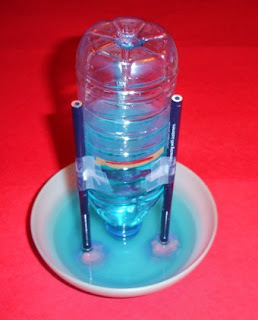 Here is an easy, fun activity that uses a recycled water bottle to make a homemade (or school made) thermometer! Fill approximately 1/4 of the bottle with an equal amount of water and the rubbing alcohol. Place the straw in the bottle. Do not let it touch the bottom of the bottle. Make sure to leave a little of the straw sticking out of the bottle. 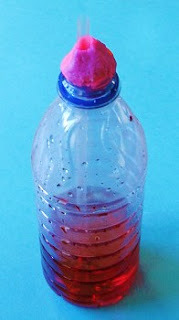 Use some clay to anchor and seal the straw at the top of the bottle. Make sure the straw is sealed well with the clay but do not squeeze the straw. Move the bottle to different locations and OBSERVE. Try putting the bottle in a sunny spot. Does the liquid rise in the straw when you place it in the sun? Rub your hands together to warm them up (with friction). Then put your hands around the bottle. Does the liquid rise in the straw? As the temperature gets warmer, the liquid will expand (take up more space) and move up through the straw. As the temperature gets colder, the liquid will contract and take up less space. Caution: Do not place this homemade thermometer in a very cold place or very hot place. It is not designed for extreme temperatures. Bill Nye always has the coooolest videos about lots of different science topics. Lucky for us, Bill has a cool video about the Water Cycle that can be found on the Gamequarium website. It is divided into 3 sections for easy viewing. Break open the water bottles, sit back, relax and enjoy the video. Oh - save the plastic water bottles for future craft activities! Maybe the kids could take some notes in their science notebooks. They could write down some important facts from the video and share their facts after the video. One of the most important topics to teach when doing a unit on weather is the WATER CYCLE. Scholastic Study Jams has a great video to introduce (or review) the Water Cycle. There also is an online quiz and lesson plan. A BAROMETER is a weather instrument that measures air pressure. Barometers record air pressure, which is the weight of air pressing down on the Earth's surface. Here are directions to make a simple basic barometer. It will record if the air pressure is rising or dropping. Tape 3 pencils to the outside of the plastic bottle. Make sure the ends of the pencils are even and stick out above the top of the bottle. Put a small mound of clay on the end of each pencil. Half fill the bowl and the bottle with water. Add food coloring if desired. Cover the mouth of the bottle with your hand then carefully turn it upside down and place it in the bowl. Mark the water level in the bottle with a small piece of colored tape or a permanent marker. Each morning and afternoon check the water level. Is it the same or is it above or below the mark on the bottle. Record the data in a science notebook/journal. Compare morning and afternoon readings. Air presses down on the water in the bowl. The barometer measures air pressure. If the air pressure rises, then the air pushes down harder on the water and the water level will rise SLIGHTLY higher. If the air pressure drops, then the water level drops SLIGHTLY lower. Have fun learning about weather.